It’s really hard to sort the element of Wind into Pokemon Types. Most of the time, you’d think it’s Flying, but that’s really more for birds. Tornadus is the only good example of a “wind” Pokemon, and, well, he’s the physical embodiment of wind itself. Meanwhile, you’ve got the north wind run by a Water Pokemon with legs. And no flight. And don’t even get me started on Blizzard. Suicune-GX is a Basic Water Pokemon-GX, 180 HP, with a Grass Weakness, no Resistance, and a Retreat Cost of 2. Phantom Winds is the Ability that lets you shuffle Suicune-GX and all cards attached to it back into your deck if it’s on your Bench. Cure Stream then is a 3-for-120 move that weakens the opposing Pokemon’s attacks by 30 before Weakness and Resistance – very useful there! 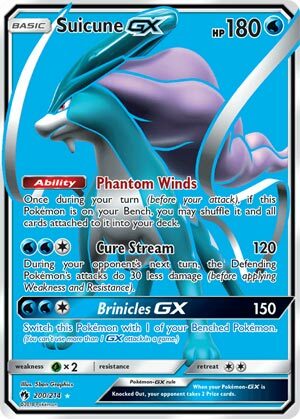 And the oddly-named Brinicles GX is a 3-for-150 that switches Suicune-GX out for another Pokemon on your Bench. Though not as flashy as other Pokemon-GX like to be, Suicune-GX provides something of an option for a lot of Water decks. Cure Stream lets it dish out 2HKOs (mostly) while tanking hits like a champ, putting it toe-to-toe with some of the strongest Pokemon out there. Brinicles GX doesn’t seem like it does much other than push damage out, but it can set up Suicune-GX for Phantom Winds, which is an extremely useful Ability to cycle resources on Suicune-GX and avoid losing Prizes at critical moments. Suicune-GX is definitely a viable contender for the competitive scene, so don’t let that first appearance fool you – he’s a force to be reckoned with! Weekend Thought: Excited for all the cards from Lost Thunder impacting the game? Think there are some decks from before that improve with this set? Thinking back throughout the year, what are some of your favorite cards that got released? Let me first say that I’m happy Suicune got the “two-prize” treatment because Suicune-EX never got into fruition. Looking at this card, it seems to be a feature Pokemon, which I shall explain why. Phantom Winds states that if this Pokemon is in your Bench, you can put this card and all cards attached to it onto your deck. This is helpful such that you can flush all the damage that a Benched Suicune would have and deny your opponent prize cards. While putting cards back into your deck keeps you from decking out, you would have to use search cards to get back Suicune in play. Though easy to say AND do, Brooklet Hill will help you get Suicune from your deck into your Bench. So that’s some good maneveur, but it also has attacks. Cure Stream is a familiar attack seen on older cards, but it does 120 damage for WWC and reduces damage taken by 30 before Weakness and Resistance. For neutral hits, you would need to do 210 damage for the KO. In the case of Grass weakness, you’ll need to do at least 120 damage for the KO because 120 minus 30 is 90 damage, then you multiply by two, which is 180. And Brinicles also cost WWC, but for 150 damage, and lets you switch this Pokémon with one of your Benched Pokemon. This GX attack is somewhat a reworking of Golisopod-GX’s Crossing Cut attack. So how do we use Suicune? Well, if you want to capitalize on the Ability, ideally, you would want to conserve those three energies without having to be shuffled into your deck. Quagsire’s Wash Out can help move energies from a Benched damaged Suicune to the new Suicune, and you can proceed to attack as usual. You can do the same for Expanded as well. Additionally, it can be another good option for decks like Archie’s Blastoise, though it’s trying to fit in in a crowded deck. That’s what I can think of. Even if it isn’t showing up at major tournaments, just finding a reason to be used makes Suicune GX a decent, functional card. Notes: I think Suicune has a few good representations, both in the video games and the TCG, because it is a somewhat competitive Pokémon to use. In the video games, it is a good bulky Water type that also can hit reasonably hard on the special side. On the TCG, you got this card and the outdated Suicune from BW Plasma Blast taking no damage from EX Pokemon. Hope you have another great weekend, the holiday and the new year is approaching by fast. And I suppose I should write ahead of time on some cards that I think would make the top 10 cards of 2018. Suicune GX (LOT 60) gets its first incarnation in the Sun and Moon era in the Lost Thunder expansion set. This Basic Water type Pokemon has 180 HP, an ability, and two attacks. Its ability, Phantom Winds, allows you to pick it up, once during your turn before you attack, and shuffle it and all cards attached to it back into your deck. This would be really great if we had a way to rearrange damage counters from one Pokemon to another on your side of the board. Or if we still had Pokemon Ranger in the Standard format – you could play Ranger, somehow get Suicune back down onto your bench, and then pick it right up and put it back into your deck. Unfortunately, right now your only option for Suicune GX is to hope it takes a hit and then hope you can retreat it so you can use Phantom Winds to waste your opponent’s prior attack. And at 180 HP, that’s becoming less and less likely, especially for GX Pokemon (honestly, 180 is a lot closer to 140 with Choice Band and Shrine). And Suicune GX’s two attacks aren’t going to set this card apart either. Cure Stream only does 120 damage for two Water and a Colorless but reduces the defending Pokemon’s attacks next turn by thirty points. Brinicles GX does 150 damage and lets you switch Suicune with one of your benched Pokemon. Overall, Suicune GX is uninspiring, and even though I’ve pulled three of them, I’ve yet to attempt to build a deck with them. I will say this: I am 2 W and 3 L against Suicune GX, and it’s beaten me when I’ve played decent decks Solgaleo GX, Zeraora Rayquaza, and Lost March, so it’s not necessarily without merit, but I’m just not too interested in it. We close out this week with Suicune-GX (SM – Lost Thunder 60/214, 200/214, 220/214). It’s a [W] Type Basic Pokémon-GX with 180 HP, [G] Weakness, no Resistance, Retreat Cost [CC], the Ability “Phantom Winds”, the attack “Cure Stream”, and the GX-attack “Brinicles-GX”. Phantom Winds is technically a once-per-turn-per-copy (before you attack) kind of Ability, but its effect is shuffling that of shuffling the Pokémon using Phantom Winds (and all cards attached to it) into your deck. If you manage to get that Suicune-GX back to the field, it can actually use Phantom Winds again, as moving from a public zone to a private zone resets such effects. Cure Stream costs [WWC] to do 120 damage, and it also places an effect on the Defending Pokémon, reducing the damage its attacks do by 30 during your opponent’s next turn. As the effect resides on the Defending Pokémon, it persists regardless of what happens to Suicune-GX, though the Defending Pokémon can shake this effect in the ways (being Benched and brought back to the active position, bounced to hand and replayed, etc.). For that same [WWC] cost, Brinicles-GX does 150 damage then forces you to switch Suicune-GX with one of your Benched Pokémon. It also gives you an excuse to look up what a “brinicle” is; it is kind of neat. Being a [W] Type gives Suicune-GX access to useful tricks like Aqua Patch and Brooklet Hill. Being a Basic Pokémon makes it easy to run and field. 180 HP is typical for a Basic Pokémon-GX and has a good – but NOT great – chance of surviving an attack. One of the reasons for that is its [G] Weakness; not the most commonly used offensive Type, but far from safe. Lack of Resistance the technically the worst and could actually be helpful here, but more on why later. The Retreat Cost of [CC] is worse than it looks, but again that’ll have to wait because it involves strategies for the card. Phantom Winds is unimpressive unless you’ve got a solid combo to exploit it; otherwise, it is giving up one last attack (maybe more) to avoid a KO. Unless it is a OHKO, in which case you don’t get the chance to Activate it. Cure Stream has an odd name, but it does decent damage for the Energy required, and the effect may even help you out, buying more time and thus making for a natural combo with the Ability. The GX-attack is a bit weak, but the switching effect can bring up a decent disruptive blocker while also setting up for a Phantom Winds on your next turn… but unless you’ve got another hit-and-run style attacker, it can be hard to justify space for a dance partner. Being a Pokémon-GX is to compensate for the HP and the potential efficacy of the Ability and attacks; don’t forget you’re giving up an extra Prize when KO’d and have to deal with all the anti-GX effects. Suicune-GX has a deck, but I’m not sure if it has any major or high-profile tournament finishes. I wasn’t able to substantiate a claim that it won something in Japan, but at least the idea looks okay on paper and performed okay when I ran into it on the PTCGO. Suicune-GX’s partners are Quagsire (Dragon Majesty 26/70) and Naganadel, though the latter may be optional (I don’t think Aqua Patch alone is enough, though). Quagsire is one of those Pokémon with an Ability that only makes sense as part of a combo; “Wash Out” lets you move a [W] Energy from one of your Benched Pokémon to your Active. Between Brooklet Hill, Nest Ball, etc. you shouldn’t have too hard of a time playing and replaying your Basic [W] Pokémon, including Suicune-GX. Once a Suicune-GX has the Energy to attack, do what you can to make it hard to OHKO. Include something to Bench it so that multiple instances of Wash Out can move its Energy to your next attacker (probably another Suicune-GX), send the previous Suicune-GX back to your deck so it can shed its damage, attack, then repeat the process next turn. Naganadel means even if you lose some basic Water Energy, you’ll have a way to get it back to the field for Quagsire to move to your attacker, plus exploiting [P] Weakness is still handy. Wash Out works with any source of [W] Energy and doesn’t care about the Types of the Pokémon involved. That means you could splash in some other off-Type attackers; a Rainbow Energy or the like even lets you handle slightly off-Type costs. You can do all of that in the Expanded Format as well, even add in useful partners like Keldeo-EX with a Float Stone. OHKO’s are more common here, however, which makes me think it won’t do as well. This is a nice pull for the Limited Format but I wouldn’t use it in a +39 deck. Well, maybe if I’m feeling a little crazy: without a Bench, the Ability can never be used, and the GX-attack is only good for damage. Cure Stream might just barely be worth it, however, as the damage output and protective effect should go further in Limited. It’ll have a somewhat slow start, however, given you’ll have no Energy acceleration.